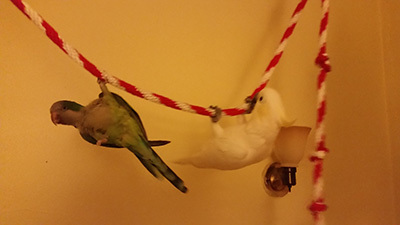 Why was my quaker parrot Qball falling down? In 2010, Qball was 7 years old, and full of himself. When I yelled at my computer in frustration, Qball yelled “That’s a bad dog!” along with me. He played with toys and hung out on my shoulder. He masturbated, then laughed hysterically. He helped me carve pumpkins, ate his fresh food with gusto, and had a huge vocabulary. He was the best little guy. But now, something was very wrong. The first time it happened, it was night time, Qball dropped to the floor and one of his legs hung limply. After five minutes, he regained use of the leg, but seemed dazed. I rushed him to the vet the next day. When you have a sick bird, your world is clouded with worry, and you want to figure out what’s wrong. I have an excellent vet, and I hoped it wasn’t as serious as it seemed. We did the standard tests, and while his weight was low, he was a small quaker. We were unable to find an immediate reason for what the vet explained to me were likely seizures. I was heartbroken. “We could do a Avina Bornavirus test,” the vet said. I knew what that meant – or at least I thought I did. They wanted to see if Qball had PDD. At the time, the association between ABV and PDD was confusing – and it still is. The way I understood it, it was likely that he might develop the disease if he had the virus. So when I got the results from the vet that he was positive, I even texted friends that Qball had PDD and was going to die. My wise friends corrected me: the disease was not always the direct result of the virus. Birds had died of PDD that did not test positive for Bornavirus. Birds who had Bornavirus never developed the disease. Still we assumed that the problems were related to ABV. The seizures were neurological – a classic symptom. We treated Qball with Celebrex, and I hoped for the best. He was on it for most of 2010, but the seizures kept coming. And he was not gaining weight, and was still having trouble breathing.. I brought him back to the vet in October, because he was having more frequent bouts of breathlessness. So we decided to do an x-ray. We hadn’t done one prior to this, assuming that his symptoms were neurological and related to ABV. When the vet showed me the X-ray, it was clear: Qball had terrible atherosclerosis. His aorta was calcified and he didn’t have long to live. What we thought were seizures could well be associated with this build up of plaque in his body, and cardiovascular disease can be associated with leg weakness and ataxia. What we had assumed was a neurological problem because of the relation to ABV was actually cardiovascular – and had we known this, the course of treatment might have been very different. Qball died 6 weeks later. I share this sad story in the hopes that if you get an ABV+ diagnosis you will consider it as only one piece of data, and not a definitive diagnosis of disease. I have no idea if Qball’s heart problems could have been treated if caught earlier. Perhaps not. But getting the correct diagnosis late in the game did not help. Over the years, some birds have died from a dreaded disease called PDD, or proventricular dilatation disease. It was first noticed in macaws that could not properly digest their food. In some other species, like greys and cockatoos, it caused neurological problems. It is a mysterious disease that we do not thoroughly understand. It is still not completely explainable. And anything inexplicable can leave us feeling concerned, afraid, and even irrational at times. In 2010, a major research project declared that the cause of PDD was the avian bornavirus (ABV). It said ABV = PDD. That’s a very declarative statement! So, at last we thought we knew the answer and could finally cope with the perplexing PDD challenge, saving our birds from future harm. Unfortunately, this “answer” caused many bird owners and veterinarians to rush to judgment, even euthanizing birds that tested positive for ABV. Now we have come to learn that many birds are ABV positive, and most never succumb to PDD. Then there are those birds that die of PDD, confirmed on necropsy, but they are ABV negative. What are we to think? What are we to do? Yes, ABV can be an important component in causing PDD, but an ABV positive bird is not automatically doomed to contract PDD, and in most cases they do not. How might ABV be spread? Some veterinarians believe that birds are born with ABV, passing it through the egg; or that birds possibly acquire ABV through the exchange of fluids during mating. Sounds kind of like HIV, right? ABV and HIV are both auto-immune diseases. As a person who strives to make sure that birds have a succession of good homes, here is my concern — do we need to worry about ABV positive birds? It is my personal opinion that we do not – assuming that the bird is otherwise healthy and thriving. We have asked many veterinarians this question over the years, and most agree that an otherwise healthy bird can be re-homed without reservation. Avian bornavirus, like many other disease challenges in our environment, can certainly place extra stress on a bird. If a bird is sick for unknown reasons, testing for ABV might be a valuable piece of diagnostic knowledge. However, there are other things we can do to prevent many diseases, and in my opinion, these are equally important! We can make sure the quality-of-life we provide parrots in captivity includes ample space to move, explore, and exercise. We can provide access to nutritious food and not crappy seed from the big box store. We can make sure our bird sees a true avian veterinarian on a regular basis – and receives the labs and gram stains that help give us early information about disease. And we can learn how to live with a parrot without expectations of inappropriate touching, over-stressing environments, or unnecessary insecurities. Meanwhile, we whole-heartedly applaud the continued efforts of the veterinary and scientific community to research both diseases; to understand more definitively what their connections might be; and to encourage balance and reason about both potential problems with their clients. Birds do not need to die when they are not truly suffering from a disease, so let’s be careful not to overreact. Last, Robert, Herbert Weissenböck, Nora Nedorost, & H.L. Shivaprasad. “Avian bornavirus genotype 4 recovered from naturally infected psittacine birds with proventricular dilatation disease in South Africa.” Journal of the South African Veterinary Association [Online], 83.1 (2012): 4 pages. Web. 24 Aug. 2018. Instant Pots have become very popular. While most meals made in them aren’t really “instant,” they do save time! Do Instant Pots include PTFE? Thankfully, no! Instant Pot reports that they are PTFE-free! As with any appliance, do not allow parrots near them when in use. It is widely known that polytetrafluoroethylene is not only hazardous to birds, but deadly. With polytetrafluoroethylene (a.k.a. non-stick coating, or PTFE) being found on many cooking and other products, including pots, pans, toaster ovens, humidifiers, light bulbs, and even in stain guard on carpet, furniture, and more, I was curious as to whether it might be included in Instant Pots. I wrote the company to find out. I heard back from them very quickly! I am happy to learn that Instant Pots do not include PTFE on them anywhere. And, I have since successfully made several meals in an Instant Pot with my five parrots safely in an adjoining room. 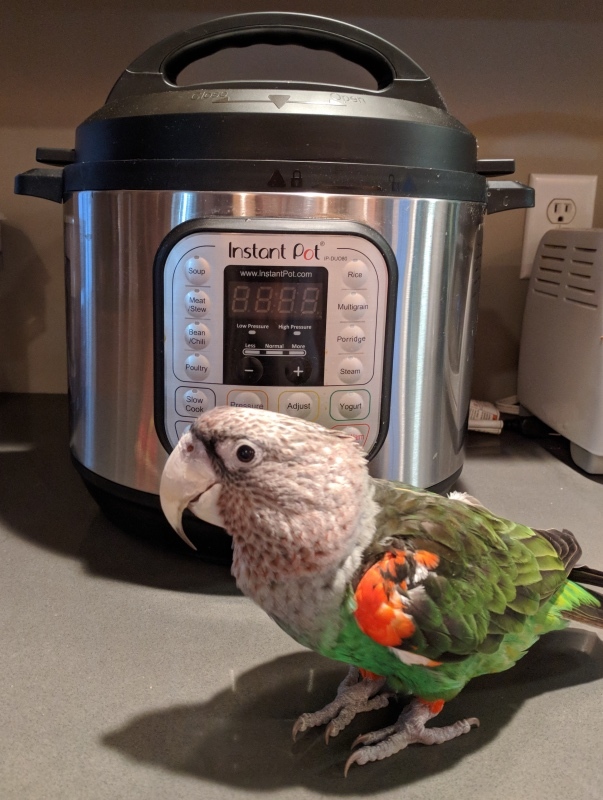 The next step may be identifying time-saving recipes we can make to feed healthy foods to our parrots using the Instant Pot. I have included the full text of the email I received from Instant Pot, in case you are interested in learning more about the components out of which they are made. That’s a great question, thank you for contacting us. Instant Pot’s number one focus is consumer safety, and we aspire to inspire the highest level of consumer confidence with the Instant Pot product line. We respect parrot safety, too! The inner pot and inside portion of the lid is comprised of 18/8, food grade 304 stainless steel, compliant to FDA standards. There is a washable, non-toxic wax-compound polish on the inner pot, for sparkle. The material of the base of the inner pot has 3 layers: 304 stainless steel, aluminum, 304 stainless steel. The inner pot is made of what’s called “austenitic” steel, which is not magnetic, as opposed to magnetic stainless steel which is called “ferritic”. This is fairly typical in stainless steel kitchen appliances. The float valve and the exhaust valve are made from aluminum. These parts have passed FDA food standard tests, and do not come into contact with food. The inner side of the cooker base is made from a type 201 stainless steel. This metal is highly rust resistant, though not rust-proof. The heat resistant paint on the cooker base is made of epoxy resin, and alkyd resin/polyester resin. This paint is resistant to heat, but not general wear and tear. The heating element is also coated with a chemical compound that has been tested for high heat processes. The coating is 2011/65/EU compliant. It contains 415 mg/kg of lead which is below the max 1000 mg/kg specified in 2011/65/EU. It contains 3 mg/kg of cadmium which is below max 100 mg/kg specified in 2011/65/EU. Mercury is not found in the material. There is no Teflon used in the making of the Instant Pot. The plastics are all BPA-free. If you should have any further questions, comments, or concerns, please do not hesitate to reach out again. In January 2018, a group of scientists, government officials and conservation representatives gathered in Trinidad to talk about parrots. This included those blue and golds trying to rebound in the wild, as well as the macaws now living in homes as pets. Since having captive parrots is still a bit controversial, there aren’t many resources for people to learn about how to care for them. 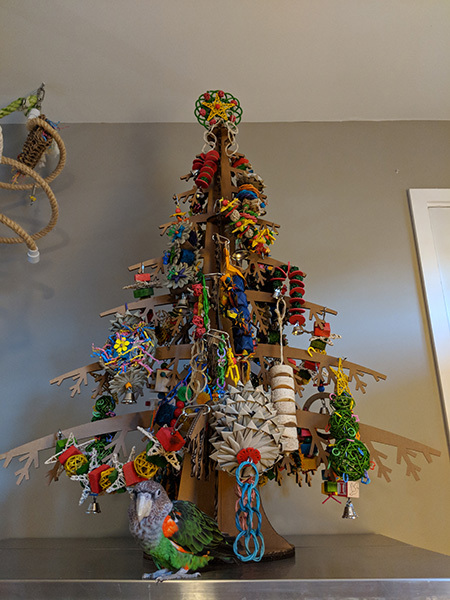 Bernadette Plair, who determined that wild macaws would not go extinct in Trinidad on her watch, decided that helping people to care for any parrots in their homes was equally important. Thus, Bernadette and her colleagues set out to provide an educational opportunity, and Phoenix Landing was asked to participate in this laudable endeavor. I spent the first couple of days meeting with Forestry officials, game wardens, and conservation representatives. We talked about the needs of captive birds, including those confiscated and permanently living in cages at the Wildlife Section. 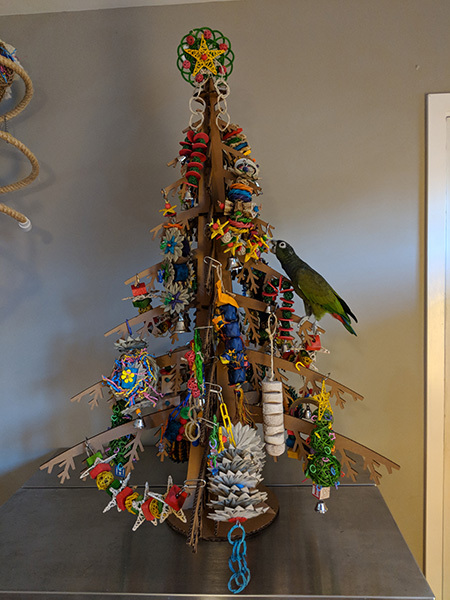 Our goal was to provide officials with additional information they can share with local residents about caring for pet birds, and also use for those macaws living in government facilities. The need for enrichment, showers, good food, behavior knowledge, and medical support are relatively new topics for Trinidad residents. For the last four days of my visit, we hosted parrot care classes for Trinidad residents and veterinary office staff. Well over 130 people attended! 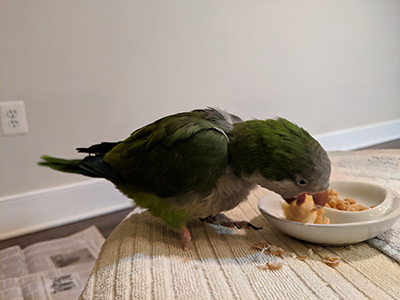 Although there is still some confusion about very old laws regarding parrots kept in homes, there is definitely a desire by the local people to acquire more information about how to care for their birds. We applaud their determination to make sure their companion birds thrive! We also hope that Bernadette Plair and her colleagues will continue to be successful in sustaining and growing the wild macaw population on Trinidad as well. They are working hard to inspire and educate the public about this conservation effort. We are so impressed with their success so far! On the last day we visited the Nariva Swamp to observe macaws that had been reintroduced into their native habitat. It was very fulfilling to see them flying free, but also sadly poignant knowing that the macaws in our homes will never fly free nor ever speak their native language. On March 3rd, 2018 in Springfield VA, our guest speaker will be Dr. Leo Douglas, immediate past president of BirdsCaribbean. He will share more information with us about the parrots of Trinidad, as well as other areas in the Caribbean. We certainly hope you can join us!